His laughter is contagious! Give his foot a squeeze and our plush golfer's head wobbles back and forth uncontrollably as he laughs, giggles and makes cute golfer comments. Great gift to your favorite golfer. LOL Golfer measures 11" and requires 3 AA batteries included. 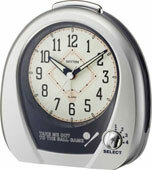 Enjoy waking up with a musical baseball alarm. Choose one of these: Take Me Out to the Ball Game, Home Run! Rise and Shine! Don't Miss Your First Class! Select the melody with the switch on the front of the clock and set the alarm. Clock also includes volume control and on/off switch; it measures 5.3" high x 5.1" long and requires 2 AA batteries included.